What was Tim Burton thinking? More specifically, what did he want us to be thinking? One aspect of a director's job is to shape an audience's reaction to a movie. He or she does this (as does a fiction writer) through tone. A successful piece of art has control of its tone, which may be comedic or dramatic or satiric or heroic or half a dozen other choices. DARK SHADOWS is a tonal mess. Burton does not seem able to decide if he is making a horror movie, a satire of a horror movie, a comedy, or a drama. For instance, Barnabas Collins (Johnny Depp), the vampire protagonist, kills two groups of innocent people. The first time, he makes jokes about it. Later he regrets having been turned into such a monster. There is a bit of introspective agonizing. Next batch of killings, we're back to bad jokes. Is Barbabas a tortured victim, a gleeful blood-drinker, a hero we should root for, what? And this is only one example. Depp struggles well with this material, but there is only so much even a gifted actor can do with a bad script and a wandering tone. Avoid this movie. Captain Jack Sparrow was a lot more fun. If I were going to use BEST EXOTIC MARIGOLD HOTEL as a teaching aid on how to structure fiction, it would fall neatly into two parts: the first seventy-five minutes and the last fifteen. 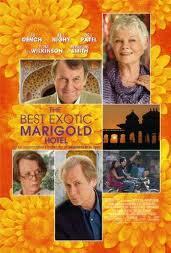 The movie concerns the fates of a group of elderly Brits who all move to a new hotel in India, where their retirement money will go much further. The hotel, which is barely surviving, is ineptly run by Dev Patel (from SLUMDOG MILLIONAIRE). This sounds like a really stupid premise for a movie full of cheap laughs. There are a few of those, but in the main, the movie is interested in the difficulties: -- romantic, financial, existential -- of its aged cast. And, amazingly, it treats these with dignity and respect. The romances are not filmed in the sneering manner of "Oh, how cute, old people acting like teenagers!" These people's failures to connect, as well as their successes at that, are serious to them, and the movie makes them matter to us. This is helped by a wonderful cast: Judi Dench, Maggie Smith, Tom Wilkinson, Bill Nighy, Penelope Wilton. Where the movie fails is in the wrap-up. After setting up a number of difficulties for the characters to cope with, they are all solved in the last fifteen minutes by having three -- three! count 'em! -- obstructive characters abruptly change into supportive and giving characters. Only one of these changes, Maggie Smith's, is foreshadowed or made even remotely plausible. It's too bad, because the movie could have kept its "villains" true to themselves and still created a positive, if more defiant, ending. In one sense, India is the real star of the movie. It serves as the catalyst for the characters' last chance to confront their life-long issues and change -- or not. Here the poverty of India is mostly downplayed, although not ignored. This India is a swirl of color and vitality, calling up the vitality some of these old people still possess. I recommend the movie. Rewrite the ending in your own mind. I did. 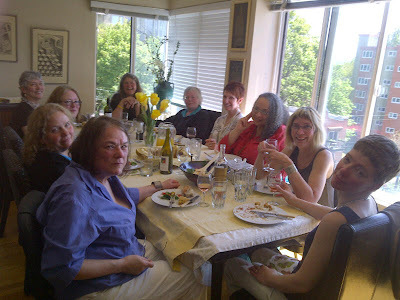 Yesterday was the Second Annual Science Fiction Ladies Lunch at my apartment in Seattle. Everyone had a lovely time (at least, I did, and they said they did). We exchanged industry information, gossip, and updates on what everyone is doing. From left to right around the table (although not everyone, alas, is equally visible -- I'm not a very good photographer): Eileen Gunn, Leslie Howle, Elizabeth Bourne, Janet Freeman-Daily, Brenda Cooper, Vonda McIntyre, Louise Marley, Nisi Shawl, Kelley Eskridge, Nicola Griffith. Out of town: Timmi DuChamp and Cat Rambo. Last year I was on a panel with four people who write review columns. It was a cordial panel but the contention was there, beneath the polite acknowledgements of each other's basic worth. Reviewers are usually regarded by writers with the same wariness that timid children regard strange dogs: Will it bite me? Like me? Ignore me? Is it safe to approach? Since I have had two books come out in the last two months, I have had a ton of reviews. Most, I'm glad to say, have been favorable. But reviews do more than label a book "good" or "bad." They can also baffle, enlighten, or frustrate. One that enlightened was Gary Wolfe's review in LOCUS of my collection FOUNTAIN OF AGE AND OTHER STORIES. The review begins: "Nancy Kress likes domes." It turns out that over half of the stories in the collection feature domes -- and I had never realized it. I, the writer. What made this particularly interesting is that I just turned in a story for SOLARIS 2 that is all about domes: their manufacture and uses and social consequences. What would Freud make of this? A review that baffled me came from the Seattle Post-Intelligencer, reviewing AFTER THE FALL, BEFORE THE FALL, DURING THE FALL. In the novella, a woman named McAllister leads a very small band of desperate survivors who can briefly visit the past at unpredictable intervals to grab supplies and children, who otherwise are destined for mass destruction. The reviewer refers to the kids as "juvenile delinquents" and asks: "Does the fact that she is saving mankind make McAllister any better than Charles Dickens's Fagin?" My jaw dropped. Well.... YES. Sometimes reviewers have opposite views that end up confusing the author. Pete, a protagonist of AFTER THE FALL, was described at Tor.com as "one of the most tragic figures I've encountered in SF in a long time....Pete's story is simply heartbreaking and unforgettable." LOCUS, on the other hand, found Pete to "at times partake too easily of what I've come to think of as the Hugh Hoyland prototype SF character from Heinlein's 'Universe' -- the rebellious young investigator in a rigidly contained society whose curiosity leads him to challenge received wisdom." And one reviewer of FOUNTAIN OF AGE AND OTHER STORIES found the stories "not scary enough." That scared me about his review. Not one of the stories is meant to be horror. So where does all this leave the writer? Sometimes shrugging philosophically, sometimes trying to learn from reviews, sometimes just ready to go drown her mystification in a bottle of nice Chardonnay. 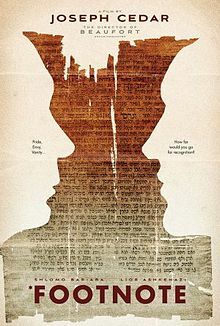 Who would have thought you could make a gripping movie about the rivalry of two Talmudic scholars? It doesn't seem a promising subject, to say the least. But the idie Israeli film (in Hebrew, with English subtitles) FOOTNOTE does just that. The movie stars two actors I never heard of, Shlomo Bar'aba and Lior Ashkenzai, who play father and son, both scholars at a major university. The father, whose work of thirty years was scooped before publication by someone else, has been reduced to a footnote in Talmudic history. The son is a scholarly success. The movie explores family rivalry, sacrifice, bitterness, and the phenomenon of prizes overshadowing the works they are supposed to recognize (not unknown in science fiction as well). The plot twists and turns, and everyone is confronted with hard and plausible choices. Best of all, the characters are never divided into "good" and "bad;" all are completely believable and humanly flawed, and the lead actors are terrific. Something I was very aware of throughout, although it has nothing to do with the main story, was the high degree of security at the Israeli university. There are guards, metal detectors, and authorized-entry lists at nearly every building. The guards are heavily armed. Everyone accepts this without comment, or even without noticing it much. This must be the price of living in Israel. This is a very good movie. Go see it. Last week Small Beer Press published my most recent collection of stories, FOUNTAIN OF AGE AND OTHER STORIES. The collection includes a few award winners (the title story won a Nebula and "The Erdmann Nexus" a Hugo), as well as seven other stories. My own favorite is one that hardly anybody else liked: "The Kindness of Strangers." Sometimes an author's taste doesn't jibe with readers' preferences. If I had my choice, I would write only short stories and novellas. They are my favorite form. However, novels are what pay the bills -- the facts of life in publishing. At any rate, the book is available in trade paper and e-book formats. So far, reviews are good. AND the publisher sent me a box of chocolates to celebrate pub day!